​Twice a year, the clans of Sacred Valley test the spirits of their children. Boys and girls of six, seven, even eight summers line up before their clan’s elders. They wear clothes too formal for them: layered robes of muted color for the boys, intricate shadesilk wraps for the girls. Parents line the walls nearby, anxious to hear the nature of their children laid bare. One by one, the children step before their clan’s First Elder. He holds a shallow bowl, twice as wide as a dinner plate, that holds nothing more than still water. But it is not water, the parents know. It is madra, the power of the heavens, purified and distilled. The material from which souls are made. The first girl in line dips her hand into the bowl, shocked at the cold. A trickle of something runs out of her core, something she’s never felt before, and the liquid changes. For her, the madra sticks to her hand, surrounding her fingers like a tight glove. The First Elder smiles, gives her a wooden badge marked with a shield, and declares the nature of her spirit. She has the soul of an Enforcer, a guardian, and will use her great strength to protect the clan. The madra returns to the bowl as the girl returns to her parents. She carries the badge with her. The water flees from the next boy’s hand, as though his presence pushes it away. He looks to the First Elder, horrified that he has somehow failed this test, but there can be no failure here. He is given a wooden badge marked with an arrow. Each child in line sees one of four responses: the water clings, or it retreats, or it rises, or it freezes. They receive badges accordingly. Shields for Enforcers, who protect the clan from its enemies. Arrows for Strikers, who strike against rivals. Scepters for Rulers, who will someday lead the clan to glory. And hammers for Forgers, who exist to create wealth for the clan. All things in Sacred Valley can be divided in four. And Lindon, of the Wei Clan and the family Shi, knows which of the four he wants. Hammer, he begs the heavens as he steps up for his turn at the bowl. More than anything, he wants to follow his mother as a Soulsmith, creating wondrous and magical items from madra. Molding the stuff of spirits and Remnants. Please, give me a hammer. He’s done his research, and he knows he needs the water to freeze. It’s traditionally considered bad luck to tell children what to expect on the day of their test, but his mother considers ignorance a greater threat than misfortune. Lindon’s mother tenses behind him, but he doesn’t look at her. He focuses on the bowl of madra. Chanting freeze, freeze, freeze in his head, Lindon places his fingers into the bowl. It’s colder than he expected, which excites him at first, because the water must already be freezing. But the liquid doesn’t grow cold, it doesn’t solidify. It sits there, placid and undisturbed. The elder’s white eyebrows draw together into one solid line. 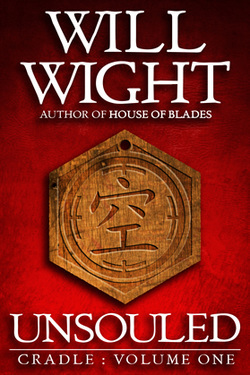 He leans over the bowl, his own badge—of polished green jade, bearing the same hammer that Lindon hopes to earn—dangling over the bowl. Impatiently, he seizes Lindon’s wrist and lifts it free. Natural water would have clung to Lindon’s skin, but this madra only imitates water. Nothing sticks. His hand emerges clean and dry. this word before, Unsouled, but it doesn’t sound like anything good. At seven, he’s old enough to piece the core of the truth together. He won’t get a badge. “Which badge do I get, Honored Elder?” he asks politely, as though he doesn’t understand. The First Elder glares at the boy. “You don’t deserve these badges, Shi Lindon.” No clan name. He must be angry, but Lindon knows that if you pretend to ignore an adult’s anger, it often goes away. “If you don’t have one for me, I could just...” Lindon reaches out for the hammer-marked badge of a Forger, but the First Elder smacks his hand down. “Can’t I pick one?” It makes perfect sense to Lindon. The bowl tells them which badge to pick, and the bowl hadn’t said anything. So Lindon might as well choose. If he has a badge, maybe his mother wouldn’t look so scared. He doesn’t know what it meant to go without a badge. Everybody has one. What you are. Not who. Lindon’s mother sweeps him out of the hall, riding on a wave of whispered comments from relatives in the clan. She hides him with her body until they escape. “Why didn’t I get a badge?” he asked, when they were free. “Because the heavens wish to shame us.” Her voice is grim, and here Lindon learns his spirit is something shameful. Until he earns a badge, he will continue bringing shame to his clan. So he needs a badge. Six months later, at the next test, he smears a drop of his mother’s blood on his palm. The lingering madra there makes the water stir, just for a second, before it returns to its placid stillness. He is tested again at eight years old, and this time he comes prepared. He sneaks into the hall under cover of darkness, scratching a crude circle of runes on the bottom of the table in the hall. He is no scriptor, but this is among the most basic of scripts, and he copies it carefully out of one of his mother’s books. The next morning, when his turn for the test comes, he runs a trickle of madra—the bare amount he can control, as an untrained eight-year-old—into the script. The water in the bowl shakes, which should earn him a scepter badge. Not the hammer he was hoping for, but he couldn’t think of a way to fake that one. But any badge will be fine; any soul is better than none. Unfortunately, it is not only the water that shakes. The bowl shakes as well, and the table with it. It takes the First Elder only a moment to glance under the tablecloth and discover the sabotage. This time, the elder came prepared. He has a badge for Lindon. It has a symbol in the middle, but not a hammer. Empty like Lindon is inside, the elder tells him. As the other children grow, they leave behind their wooden badges. Their mastery over madra, their skill in the sacred arts, increases day by day. The earliest among them reaches the Copper stage at nine, upgrading his badge accordingly. The latest is thirteen. At fifteen, Wei Shi Lindon is the only one who still has his original badge. Still wooden, still empty. Every half a year, when the children have finished their test, Lindon slips in and judges his own spirit again. Every time, he hopes the heavens will finally have mercy on him, as his mother once said. He’s tried seventeen times now. The water has yet to move.